Surprise is a rich Red yellow eyeshadow. The perfect accent for the eye. 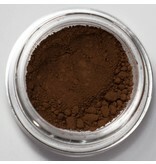 You can use him all over the eye lid as a liner, accent color (V) area or even a bone color. Code: This guy is the most harmonious in the Bright Spring palette. Both the Master Sci/Art Consultant book and the 12 tones.